Last week the National Association of Realtors (NAR) reported that distressed properties accounted 31 percent of sales in June. 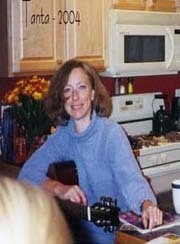 Distressed sales include REO sales (foreclosure resales) and short sales, and based on the 4.89 million existing home sales (SAAR) that puts distressed sales at about a 1.5 million annual rate in June. 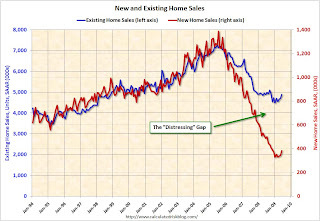 All this distressed sales activity has created a gap between new and existing sales as shown in the following graph that I've jokingly labeled the "Distressing" gap. 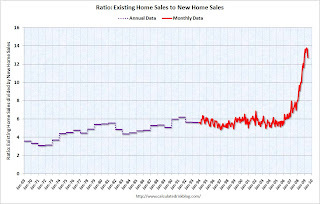 This is an update including June new and existing home sales data. This graph shows existing home sales (left axis) and new home sales (right axis) through June. 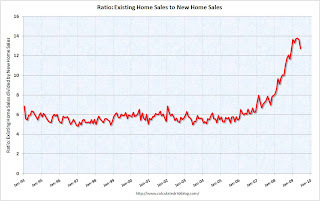 The second graph shows the same information, but as a ratio for existing home sales divided by new home sales. Although distressed sales will stay elevated for some time, eventually I expect this ratio to decline back to the previous ratio. The small decline in June ratio was because of the increase in new home sales. The ratio could decline because of increase in new home sales, or a decrease in existing home sales - or a combination of both. The third graph shows the ratio back to 1969 (annual data before 1994).